This article is authored by Melanie Pador, with inputs from Aldinson Esto: they are members of ONE Cebu Adventure Team and BisdakCentral.com. PinoyMountaineer thanks Ma’am Melanie and her group for their contribution and support to the site. 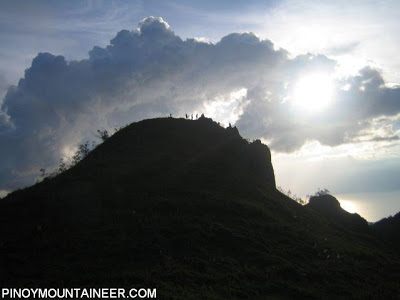 Osmeña Peak is situated in Mantalongon, Dalaguete also known as the “Vegetable Basket” of Cebu or “Little Baguio” because of the vast vegetable farms in the area. The mountain is actually a series of rugged peaks that have been compared with the Chocolate Hills of Bohol because of its interesting formations. 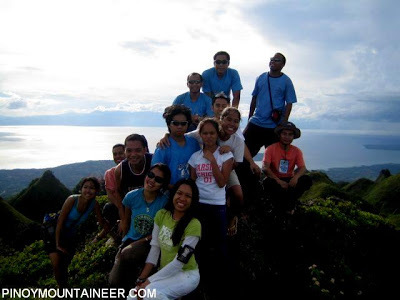 At 1013 MASL, Osmeña Peak is considered the highest peak in the province of Cebu. The peak was named after the Osmeña family, an influential political clan in the province. 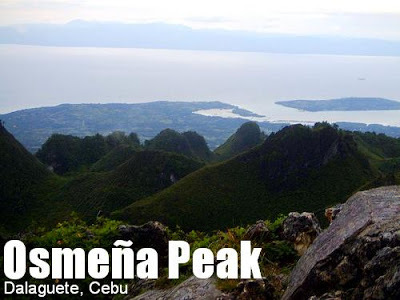 Osmeña Peak is accessible all year round, but to avoid the hassle of rain and slippery pathways, it is best to climb the peak within the first half of the year. 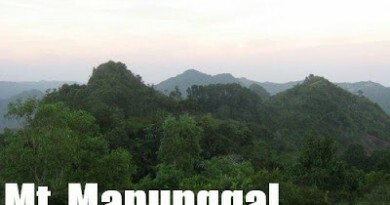 The town of Dalaguete is about 85 kilometers from Cebu City. To get there, one should board a mini bus that travels directly to Mantalongon Market. This bus parks at a Caltex gasoline station near Carbon Market. Climbers may also board a bus from the South Bus Terminal, stop at the Dalaguete corner to Mantalongon and take a “habal-habal” [motorcycle for hire] ride to Mantalongon Market, or directly to the foot of Osmeña Peak. Dalaguete is on the eastern side of the province of Cebu. The Cebu south road diverges at the town of Carcar. To get to Dalaguete, one should take the left road, pass by the town of Sibunga and then arrive in Dalaguete. The right road leads to the southwestern towns of Cebu namely Barili, Dumanjug, Moalboal, Badian, etc. Starting from Mantalongon Market, a rough barangay road – about 1 hour to 2 hours hike – leads to the foot of Osmeña Peak. Climbers have the option to either walk or ride a “habal-habal”. From the foot, the summit is around half an hour away. A water source is located along the trail to the summit. It is advisable to fetch as much water and carry it along towards the campsite or peak. The neighboring mountain ranges of Osmeña Peak are mostly pointed and rocky, the very trade mark of the area. Some of the mountains don’t have very sharp peaks and, hence, resemble Bohol’s Chocolate Hills. 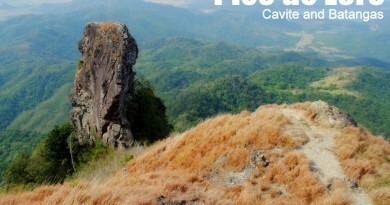 These peaks can be likened to Bohol’s native delicacy, Peanut Kisses, though. The area is somewhat bare to thinly forested because the locals are farming most of the lands. The peak area is privately owned and has been fenced. 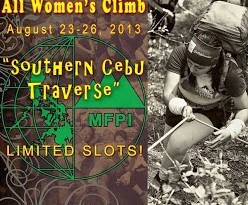 A lot keeper collects Php20 from each climber that enters the area. At the peak, one can have a 360-degree view of Cebu South [more on the southwest side] plus a sneak peek of Negros. It is not advisable to set camp at the peak and campsites are normally established a few meters down the peak. A man-made toilet and a poorly-built bunk house that can be used for a fee are available at the campsite. However, it is still preferred to spend the night inside pitched tents. The camping ground has loose rocks and pebbles making it quite tedious to lay down the pegs. Large rocks can be used to hold the tent in place by tying ropes tent-to-rock. Thick fog starts to envelope the campsite by early evening, and to some extent, there will be zero visibility. Temperature at the peak and the campsite is bearable, however, it is still advised that climbers wear winter clothes in order to keep themselves warm when the temperature drops and the wind picks up. It is said time and time again that the campsite is the gateway from the spiritual realm to the physical realm and vice versa. Several climbers have their own versions of ghost encounters. Years back, there were also incidents of campsite theft and robbery. 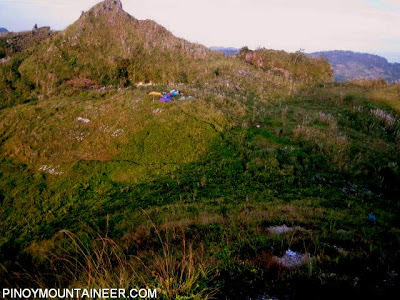 However, through the efforts of the local government, the suspected thief/thieves were seized and Osmeña Peak is a relatively safer campsite once again. Barangay Tanods also patrol the area for added safety. Still, climbers are advised to be always vigilant and on-the-watch. Socials and camp gatherings at the campsite are perked up by these ghost and robbery story-telling sessions. And when feasible, climbers may do night trek up the peak to socialize there. During the second day, it is preferred to have an early wake up call, say around 5 a.m. so that climbers can start trekking down to Kawasan Falls and reach there by noon in time for lunch. The next water source from the campsite is at least two hours away hence, it is advisable to sufficiently load hydration packs and water containers from the first water source. The route to Kawasan Falls in Barangay Matutinao, Badian is a cut through headed to the southwest direction and follows a rugged terrain downhill. The path, usually treaded by locals carrying heavy loads of farm produce, is rocky and at times slippery. The landscape is mostly farmed with few tall trees. The trail passes by hidden valleys, lime canyons, green plateaus, slight elevations, and lowlands. Climbers pass through local communities and clusters of houses, the residents of which can be asked for directions and other required assistance. A few “sari-sari” stores are also located along the trail. There are no specific hazards to expect during the downhill route to Kawasan Falls. The main adversaries are the roasting heat of the sun, few water sources, slippery pathway especially during rain, snakes, and the locals’ dogs that may bite anytime. Climbers may greet encountered locals by saying “Maayong buntag” [Good morning], “Maayong Udto” [Good noon], “Maayong Hapon” [Good afternoon], or “Maayong adlaw” [Good day], which can be coupled with “Agi lang mi” [We’re just passing by]. Upon arrival at Kawasan Falls, climbers may spend some time to rest their muscles and cook meals while resting before taking a dip in the cool waters. 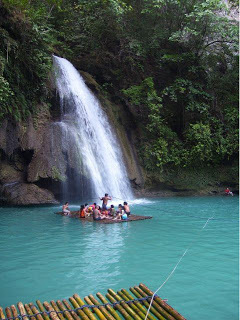 Kawasan Falls is a magnificent three-level cascade of clear spring water in Matutinao, Badian around 100 kilometers from Cebu City. The main source of the Kawasan Falls or level 3 is the first stop for climbers following the itinerary below. Level 3 is also the third water source for climbers. Cottages, rest houses, souvenir stalls, and restaurants are available mainly at levels 1 and 2. Bamboo rafts are also available for a fee. 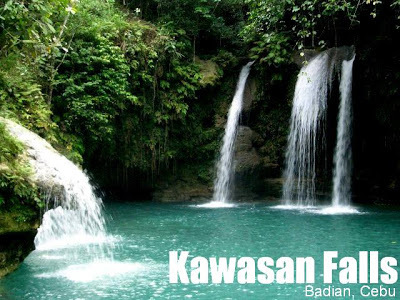 Kawasan Falls is a good venue for family and group picnics, besides a dive-and-swim in the water. The area is thickly covered with trees and plants. The path up and down the three levels of the falls has been established and maintained with a few hanging electrical lights to guide night trekkers. Transportation to Cebu from Manila is a usually via a quick 1 hour plane ride to Mactan Airport – which is around 30 minutes away from Cebu City. Fares range from 2000-5000 pesos, with the lower end representing early bookings with budget airlines such as Cebu Pacific Air. Meanwhile, local transportation is by jeepneys, tricycles, and taxi. Bear in mind that 2000H is the last trip from Matutinao Bus Stop to Cebu City on Day 2 of the above itinerary. Osmena Peak and Kawasan Falls can independently reached by a dayhike, and the traverse trail can actually be shortened into a daytrip as well, but the overnight camping is recommended. Bring large empty bottles to fetch water from the first water source. Bear in mind that the campsite caretaker collects P20 per climber and he also gets the garbage of the campers, so there’s no need to bring the garbage during the traverse. Insect repellants are recommened especially in Kawasan Falls which is said to be infested by mosquitos. The campsite is a quick trek from the summit, and is maintained by a caretaker. Late afternoon view of the summit of Osmena Pk. Climbers enjoy the view at the summit; the rugged peaks at the background are the multiple jagged hills that comprise the Mantalungon range. 74 Comments on "Osmeña Peak/Traverse to Kawasan Falls (1,013 +)"
Does a trails from osmena peak going to kawasan falls in Badian cebu is much accessible??? Hello Victorino, thanks for the inquiry. 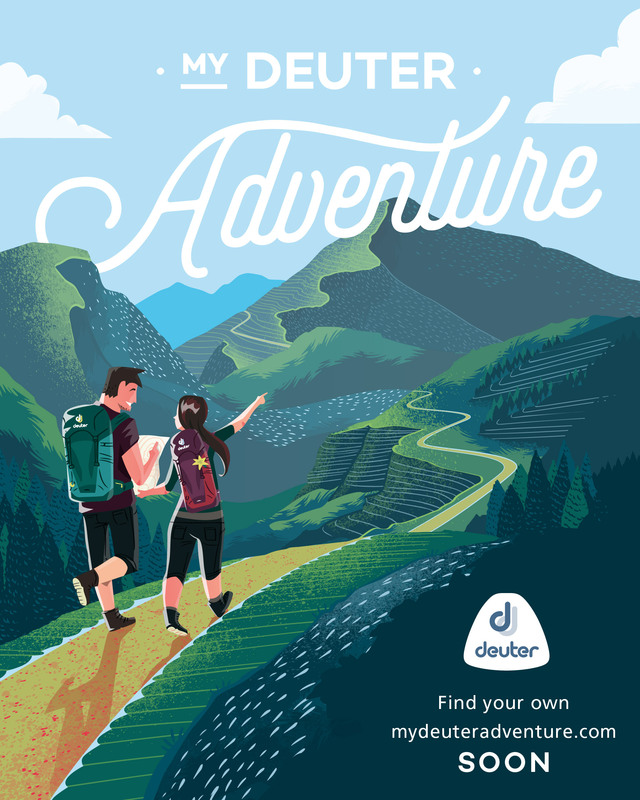 Do you mean traversing osmeña peak to kawasan falls with a bike? yes, there is a trail where MTB can access, it’s via the barangay road but you can still passby some of the beautiful forested areas of the traverse. You can ask the locals/farmers living along the trails for directions. kumusta ang peace and order sa osmena peak camp site? wala nabang mga robbery issues as of current date? ilang hours pabalik ng cebu from Badian after traverse (by bus)?